Sketchfab possible GUI update (for animations)? + audio on animations? Could the recent Animation GUI be updated to something more easy? its already nice but i mean like having a tab on the side to slide so you can select animations a bit easier also maybe audio with animations? Thanks for the mockup! These are definitely things we'll be thinking about for future updates. thanks for the suggestion. About the sound, what kind of sound would like to have? Could you describe a case where you would use sound? This would help us narrow down what's needed if we implement sound in the future. I personaly would like to add audio files to comment my 3D model or play music that would fit the model. So .mp3 or wave would be just enough for me. I really would love that feature. We just launched our Sound feature! Shhh. Listen, do you hear that? 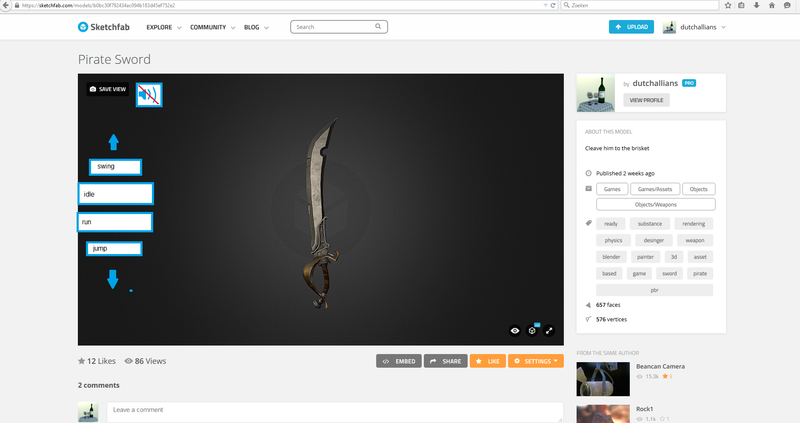 Until now, Sketchfab was silent, but not any more. Today we’re excited to announce support for sound, a fourth dimension!